Pic of the day: Trash galore! Back when I was a kid, taking out the trash was a rare and memorable event. I grew up on a modest farm, where we made many of the things we needed locally. We were a family of four children, four grown-ups and an autist who was hidden in the attic; so any food was likely to disappear into our gaping maws well before it spoiled. And contrary to what you may think, food does not grow with shrink-wrap plastic around it. We pulled up vegetables from the ground, and fish from the river (and sometimes the fjord), and occasionally my father would kill one of my furry friends for dinner. The dog got the bones, and the hides were cured. Paper and cardboard was saved up and burned. In the winter anything that could burn was useful, since the house was about a century old and not too well insulated. Paper made much ash for the rather limited heat it gave, but it was a good way to start a fire. And the ash was set aside and later spread on the fields. In the summer we sometimes made "pyres" from paper and other flammable stuff, such as bark or branches. Both I and my youngest brother had a certain fascination with fire, though only I managed to actually set fire to the garden fence. Virtually the only real trash was old light bulbs and empty tin cans and the like. Metal and glass. These we collected in a bucket, and a few times a year we would empty it. I remember that I eventually got the honor of doing this. I went down to the bridge and emptied it all into the river, which would eventually take the trash out to the endless ocean. I doubt it got that far, except for the occasional lightbulb and perhaps a rare bottle. Most of our trash is probably still buried in the delta where the river meets the fjord, and will not see the light of day again for many million years. That was then, this is now. I remember when I moved from the farm and found that other people had a trash can. There they dumped anything they did not want, and each week it magically disappeared. No wonder this has become an essential part of our most popular operating systems. But how long was Adam in Paradise? Only till the first fall. 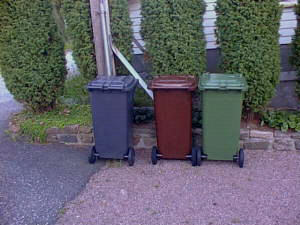 Now there are three different garbage bins outside my home. The green is for paper and cardboard. This is supposed to be recycled into new paper and cardboard, but due to a glut at the processing plants it is likely to end at a landfill eventually. The brown bin is for food/organic garbage. It is only emptied every other Thursday, and it's not a good idea to let things lie there for too long, especially in the summer. Two weeks is probably just fine for most humans. But for me, two weeks is a sea of time. It's enough for entire empires to rise and fall. (For instance, the Klackons are due for a fall tomorrow, though I suspect some may remain until Saturday or even Sunday.) Anyway, the wheel turns, and even myth is long forgotten when the garbage truck comes again. As a result, I steadily approach my own weight in moldy, hairy, festering, frozen or refridgerated food scraps. The black bin is for ordinary garbage. This probably means plastics. It does not mean batteries, which are to be delivered to a special container in some central location which I don't know where is. In the same place there is also a special container for glass. Possibly one more thing, I am not sure. No, I think there should be one for clear glass and one for colored glass. I will probably find out when I eventually see them. I have no idea what to do with burned-out light bulbs, which are glass but not really. I have a whole stack of them in my cupboard. I guess I could sneak down to the bridge one night and throw them on the river. Except the rivermouth (or "Åros" as it is called in Norse) happens to be the favorite family beach around here. Speaking of my childhood, today I met with my oldest brother and his family in the city. They're on a vacation here. As I tend to repeat, the south coast is where Norwegians go to relax in the summer. Even a chilly summer like this (and it has been unusually feeble so far), you can still get a sunburn if the clouds stay away for a full day. They did today. We ate at an Italian restaurant, Bella Napoli. The brother family is studying Italian, well at least the grown-ups are, and for some reason intend to go there at least once next year. Why they would when they can eat the food here is beyond me. Risking life and limb in the crazy traffic down there. But hey, it's their lives. We all have our quirks I guess. Anyway, Italian food is my favorite too. Especially the food we consider typical Italian, such as pasta and pizza. It contains only moderate amounts of meat, for instance. I'm a lousy carnivore, which probably goes back to seeing my playmates on the plate when I was a child. While I can eat meat, I don't like much of it. The typical Italian food is not only healthy, it is also tasty. So I recommended Bella Napoli, which has excellent food. The one thing that detracts from this restaurant is that they seem to have a strong aversion to bringing you the bill. I've noticed this every time I eat there. It's like they hope you'll sit there till you grow hungry again, or something. That would take some time, since there is lots of food. My nephew was seriously worried that he might explode, a feeling I can really sympathize with. And then we went each to our own: They went back to camping, and I went home and razed some Klackon cities and banished a treacherous wizard to limbo. And took out the trash. The moon is almost full, and so am I. It is a good time to be a human.